You must make reservations at least 5 minutes in advance of the time at Cardinals Nation. Non-Game days Free 3 hour parking with validation. With over 60 TV's Cardinals Nation is the go to place for fans of all sports. Cardinals Nation has many private dining and banquet options. Anything from a Birthday to a Wedding to a Corporate Event, Cardinals Nation offers great space and menu selections for you to choose. Cardinals Nation offers fans of all ages a one-of-kind, world championship caliber experience unlike any place else. The best fans in the game will come to play here all year round because the baseball season never ends at Cardinals Nation. Cardinals Nation is the ultimate Cardinals headquarters. I knew it was going to be a buffet, but the “hot” food was cold. Who likes cold egg sandwiches? The pancakes were the frozen variety the cinnamon rolls were stale. The only somewhat decent item was the bacon. Once again the Y98 breakfast was outstanding!! The food was excellent and our server Jake did an outstanding job. The atmosphere was perfect for a Cards home opener and we had the best time ever!! Food was really good. The bathrooms are awesome looking. And we had a brand new waitress but she was very nice and did a good job. Out server was not very attentive and it wasn’t crowded, so that was a bit concerning, however, everything else was fantastic!! The happy hour specials were a deal! The food was well presented and delicious! We will certainly dine here again! Poor service for overpriced bar food. Wd were pleasantly surprised at the qualitg and taste if the food. We happened to be there 2 hours before the Blues game so there were food and drink soecials. Fun afteroon watching Cardinals Spring Training. Good food, great service from Jake and we had fun with Trivia Games and giveaways. Amazingly delicious food, friendly and helpful staff with the best view in the Lou! We enjoyed each and every moment and will be back! We had a group of 10, they were very accommodating for the group. Ambiance is great as well. The food and mixed drinks were below average, not expecting anything 5 star at a casual baseball themed restaurant but wanted good food.... wasn’t the case as all the food was below average. Great atmosphere for Cardinal fans and best value for food prices! Terrible service and they weren’t even busy. Our waiter didn’t really check on us, I needed water refilled and after 20 minutes of him being gone I gave up on needing any since the next time he came was with the check. We got out of there as quick as we could, which was hard since he was gone most of the time. Didn’t stop to ask how the food tasted, if there was anything he could get us. Just all around terrible service. Food was fantastic. Service was great. Not that I’d expect to have great wine at a sports bar but that’s the worst wine I’ve ever experienced in my entire life. Enjoyed the Valentines Day dinner which included 2 appetizers, 2 entrees, a shared dessert and bottle of house wine. We arrived early for our reservation but were seated right away and immediately greeted by our server. Our food - chicken for my wife, salmon for me - was very tasty and presented attractively. Our server was attentive without hovering. We think they hit it out if the park for the overall experience. Our Valentines Day meals were fabulous. Many choices, with us and another couple dining that night, we all enjoyed our appetizers/salads and entrees. Our Cabernet Sauvignon was very good. The only complaint is that the price has gone from a super value to worth about what we paid for it this year, which was $90 per couple. But the service, ambiance and noise levels were all great, and made for an enjoyable Valentines day. Everything was great for a Valentine lunch until the hostess seated a group of 6 by my husband and me. It then became a very noisey experience but overall everything else was great. Waiter was exceptional. Always enjoy Cardinal Nation. My boyfriend and I attended the Valentine’s Brunch and it was great. The food was amazing and the servers Maddie and Jake were very helpful and the best we could ask for. We look forward to coming back! We had a very nice day a cardinal nation, Jake our server, was probably one of the best servers we ever had at any restaurant we have been to. Food was great and the atmosphere was awesome i really cant wait for baseball season now. That you Jake for a very awesome experience. Jake our sever made the experience! He was so amazing; very personal and outgoing and always ensured we were well above satasfied. We are coming back before he heads to his next adventure! Cardinal nation is losing a great asset. 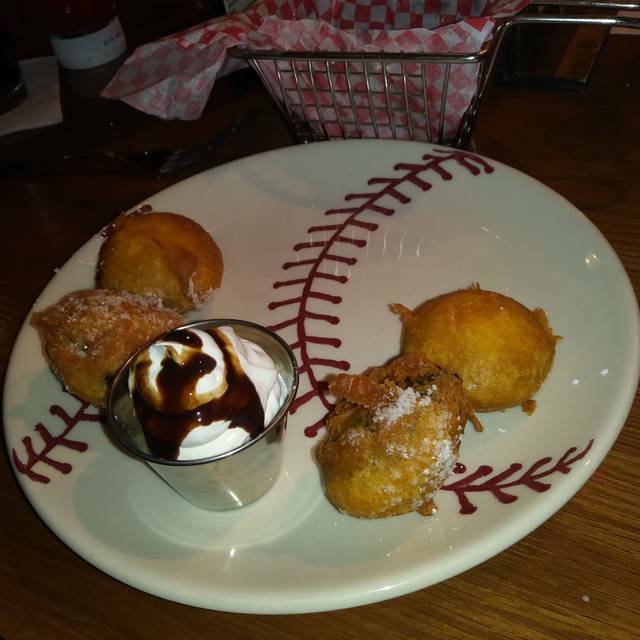 We enjoyed the overall restaurant experience as Cardinals fans, but the food was average. The service was great. Our server was attentive and friendly. For what we paid and the food quality I won't go back however the Cardinals themed decor is fun and its location is great. With no major events going on downtown, we decided to for Family night - kids eat free, get there before 7 and happy hour prices in effect for draft beer and certain appetizers. Our waiter was great - very friendly as were all the other staff. Food was as ordered and came quickly. The bonus was on Family night right now with no baseball, Fredbird was there from 6:30-7:30. He took time to not only stop and say hi to all tables but played with all the kids that were there. Great photo opportunities. Made the Wednesday night dinner really special. When the Cardinals play Baseball this could well be a good venue. On the night we went in early January the place was empty, the food was extremely disappointing and to describe the quality of service provided as indifferent would be generous! The four Entrees were awful and unworthy of any product associated with the Cardinals Franchise, which typically is associated with excellence. Please note this is the first time I have ever been sufficiently motivated to bother sending a negative review!! The flavor profile of each of the dishes was just wrong. For the amount of money I expect food that tastes better than a cheap fast food place. Tracey, the hostess, was phenomenal. She was kind, fun, and welcoming. She even played with our son while we were eating. She went out of her way to ensure that my son had the best 4th birthday dinner. She is definitely an asset to Cardinals Nation. The food was really good, the beer was cheap (on happy hour), and the birthday brownie was delicious! I highly recommend this place. If you bring your kid on a Wednesday night, they eat free and get to meet Fred Bird! No one was at the reception area so after my wife arrived we went to the bar and were told we could sit down. Eventually we received menus and were able to order. The food was good but no follow up until after happy hour ended. Good experience. Great attitude. Great food. We were very happy with the service. We were really happy they had high chairs and baby changing station for us who have kids. Would definitely go back again. Would definitely recommend other people to go. Staff and crowd were great. Shannon was awesome, as always. We love coming for DJ Joe and Fredbird was a nice surprise. The tater tots were perfectly crispy. We will be back soon and often. My only gripe was our table was in the sun and no shades on the windows. Half the table had to eat with their sunglasses on. This is the third year we have been to the Santa brunch. We love the third floor activities and that you keep very close time to reservation- last year we were even seated early. The food is great and a nice variety. The only complaint I have is that the 2nd floor room off to the side has an unbearable amount of sun at that mid morning/noon time. This is the second year we have sat in this room and it’s horrible. Last year I ate half of my lunch with my eyes 1/2 closed and couldn’t look at my family while talking to them. This year, my back was to the Sun and it was soooo hot throughout my meal. My kids were squinting when they talked to me. They really need to invest in a shade for the side that faces the field. It’s really disappointing to sit so uncomfortably for 2 years on a special event that I host for my family and in-laws. We were really disappointed in the food. It was nice but the website said regular menu. Instead, it was a buffet that wasn’t kid friendly so we ended up going out to eat afterwards. Also for the price, the activities for kids should have been more fun and the staff way more friendly. The photographer was rude, loud and bossy, the balloon makers were quiet and just not very friendly. This is a very good idea for an event but it needs some work to make it much better. Also, it would be nice if there were two Fredbird and Santas- one upstairs for formal pictures and one downstairs going table to table interacting with the kids and families. Disney style! This was a special brunch with Santa and FredBird. Everything was first class! The selection and quality of food were incredible! In addition to traditional breakfast fare, the buffet offered eggs Benedict, made to order omelettes, carved prime rib and turkey, and fresh shrimp and oysters. The brunch included a complementary Mimosa or Bloody Mary as well. Lovely! Everything was fantastic! The only thing I'd say when it comes to the brunch with Santa/Fredbird is maybe include some other activity for the younger ones. My son is 1.5 yrs old and doesn't really color yet (he likes to eat the crayons) and couldn't really get his face painted because he doesn't understand it yet. This was our first year attending the event with Santa and Fredbird and it was perfect! The options during brunch were way too many to name but even the pickiest of eaters would have found something to enjoy! The service was excellent and they made us feel comfortable and at home during the entire meal. We can’t wait to do this again in the future!!! Have gone to the brunch with Santa and Fredbird for the last 3 years, have always loved the experience and entertainment. This year was disappointed with service mostly! We were one of the few first to brunch, seated with Sun in our eyes, waitress was unaware if they had apple juice for the kids. Had a glass of water spill (adult accidentally) and had to go ask for assistance with the clean up! We went to Brunch with Santa face painting which is always a hit especially with the girls, and of course, Santa and Fredbird. They have sheets and pencils so the children can fill out their list and give it to Santa. And then there's the brunch! Such a great variety for adults and children. And there are adult beverages as well as juices for the kids. We love going every year!